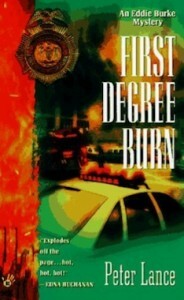 FIRST DEGREE BURN was published by Berkley-Penguin on July 1st, 1997. The first and only printing was 55,000 copies—a large run for paperback original. Two months later, the book had sold so well that it ranked No. 35 on The Ingram A-List—The Top 50 Requested Titles in Mystery/Detective Fiction. The A-List, compiled by the nation’s largest whole-saler of books, was a true best-sellers list of the top authors in the genre from Agatha Christie, John Grisham, Robert B. Parker and James Lee Burke, to Patricia Cornwell, Stuart Woods, Lisa Scottoline, Donald Westlake, Faye Kellerman and Tony Hillerman. In fact, without any promotion from the publisher, beyond the mailing of galley proofs to reviewers, First Degree Burn succeeded in ranking right behind the trade paperback edition of James Ellroy’s extraordinary mystery L.A. Confidential, the week the film adaptation of Ellroy’s New York Times best-seller hit theaters. The film-noir thriller tracing the exploits of FDNY fire marshal Eddie Burke even got a starred review in Publisher’s Weekly, a rare feat for a paperback original. 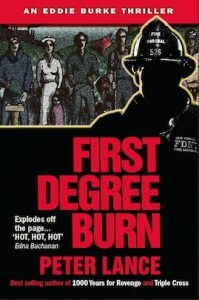 A NEW UP-DATED EDITION will be available as a trade paperback on amazon.com and barnesandnoble.com and as an ebook April 8th. It’s been entirely rewritten and updated with multiple new chapters. What follows is a description of the novel and the critical reaction that followed its first printing. It happens every day in the City. Gas is poured. A match is lit. Building, bodies and dreams go up in flames. FDNY Fire Marshal Eddie Burke walks among the wreckage. A different kind of detective for a different kind of crime. When a fire rages in SoHo a priceless mural from the 1930s is destroyed and a young woman lies dead in the ashes. After the victim’s abusive ex-boyfriend is killed resisting arrest the NYPD closes the case. But Eddie Burke, son of the former NYPD Chief of Detectives can’t let it go. He knows the arsonist was a pro and he’s still out there. “Eddie Burke comes at you like Popeye Doyle in ‘The French Connection.’” Sonny Grosso, NYPD Detective. (retired).